Page-Based Comments – Provide a way for website visitors to comment on pages of your site. This is traditionally used as a mechanism to get direct feedback about a page design, broken links or problems people are having with a specific page. Unfortunately, most of this feedback will be negative so you need to have “thick skin” when analyzing this data! Website Satisfaction – Provide a way for visitors to rate their overall satisfaction with your website experience (vs. specific pages). This is normally done by presenting visitors with an exit survey where you ask standard questions that can tell you how your website is doing and compares your site against your peers. There are numerous vendors in each of these spaces and the goal of this post is not to compare them, but rather discuss how you can integrate Voice of Customer data into your Omniture SiteCatalyst implementation. In this post, I am going to focus on the first of the aforementioned items (Page-Based Comments) and specifically talk about one vendor (OpinionLab) that I happen to have the most direct experience with (their headquarters was a mile from my home!). The same principles that I will discuss here can be applied to all Voice of Customer vendors so don’t get hung up on the specific vendor for the purposes of this post. Many Voice of Customer tools charge by the user so if you can port their data into SiteCatalyst, you can expose it to an almost unlimited number of users. You can use Omniture SiteCatalyst’s date and search filters to tailor what Voice of Customer each employee receives. 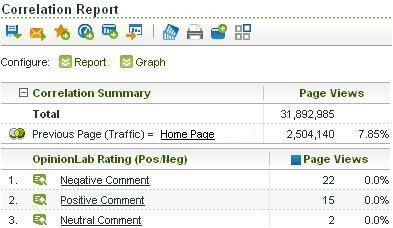 You can divide Voice of Customer metrics by other Website Traffic/Success Metrics to create new, interesting KPI’s. You can use Omniture SiteCatalyst Alerts to monitor issues on your site. I hope to demonstrate many of these benefits in the following sections. So how exactly do you integrate Voice of Customer data into SiteCatalyst. 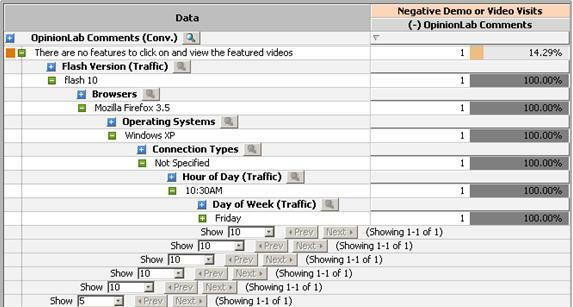 For most VOC vendors, the easiest way to do this is by using Omniture Genesis. These Genesis integrations are already pre-wired and make implementation a snap (though there are cases where you may want to do a custom integration or tweak the Genesis integration). You can talk to your Omniture account manager or account exec to learn more about Genesis. 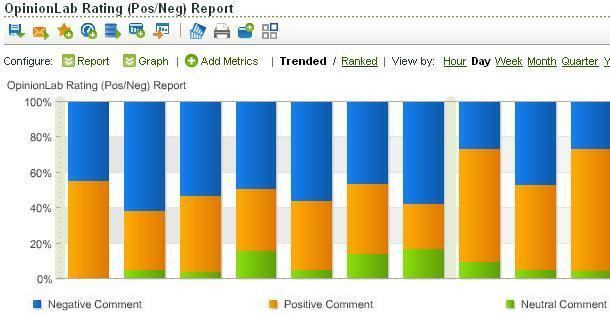 Set three custom Success Events for Positive Page Ratings, Negative Page Ratings and Neutral Page Ratings. These Success Events should be set on the “Thank You” page after the visitor has provided a rating. Pass the free form text/comment that website visitors enter into an sProp or eVar. If they do not leave a comment pass in something like “NO COMMENT” so you can make sure you are capturing all comments. If you are going to capture the comments in an sProp, I recommend you use a Hierarchy variable since those have longer character lengths vs. normal sProps which can only capture 100 characters. Use the PreviousValue plug-in to pass the previous page name to an sProp. 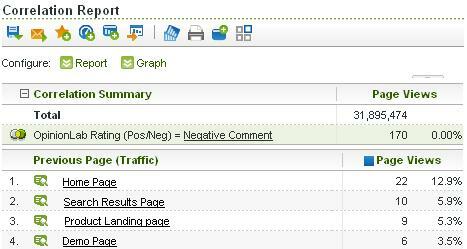 Create a 2-item Traffic Data Correlation between the Previous Page (step #4) and Page Rating (step #3). This allows you to see what page the user was on when they submitted each rating. All in all, this is not too bad. A few Success Events and a few custom variables and you are good to go. The rest of this post will demonstrate some of the cool reports you can create after the above implementation steps are completed. 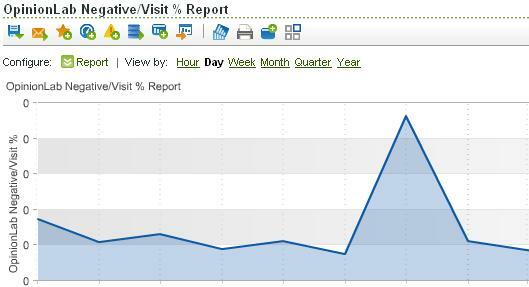 This graph allows me to get a quick sense of how my site is doing over time and can easily be added to any Dashboard. You can create a Traffic Data Correlation between the Comments variable and the Previous Page variable so you can breakdown comments for a specific page. Therefore, if you have users that “own” specific pages on the website, you can schedule daily/weekly reports that contain comments only for those pages so they don’t have to waste time reading all of the comments left by visitors. Now you can watch how the user entered your site, what pages they went to and see exactly what they had done prior to hitting the Voice of Customer “Thank You” page. Great post as always and this type of integration should be done a lot more often. I’ve also worked capturing a unique survey respondent ID for customer satisfaction surveys in an eVar and then using SAINT to import the respondents answers to the top 30 or so questions. 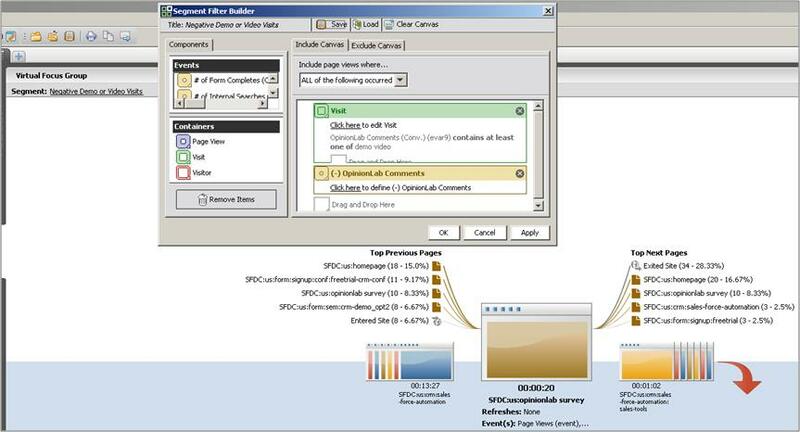 This enables you to break down campaigns by satisfaction or using Discover to work in either direction by staring with a site experience and then looking at the survey results or by starting with the survey results and looking to the web analytics data for clues to why visitors answered the way they did. Great stuff if you have a good researcher to work with your web analyst! You highlight Page-based and Website comments. Would it be worth considering VOC comments for channel independent questions, ones that are more product or business in focus? “Would you recommend us to a friend?” (what some people now call the Net promoter score). “Would you consider purchasing again if we bundled products X, Y and Z” Etc. I would see these questions and their integration being implemented in the same way you suggest above. In addition to this, for some industries you could incorporate information on product holdings (single product, subscriber, multi-product, frequent purchaser etc.) or customer value segments (business user, private customer, high/low value etc.) via the use of online product purchase history, targeted email IDs or a customer IDs. I’d recommend using SAINT classifications for uploading customer segments against the customer ID or using a Genesis integration to incorporate a customer segment ID via a targeted email campaign. This could offer some fantastic insight for product marketing and management teams who perhaps aren’t always focusing on the opportunity of getting data from the online channel as much as they could. It enhances the qualitative market research figures they might normally use with more quantifiable aspects of purchase behaviour and value segments. Dave – Great comment! I agree that this is only the tip of the iceberg. If you have a website where you know who the person is and what products they have (i.e. some sort of login like a bank), you can correlate survey answers/scores to customer types/personas and use them as a proxy for your satisfaction for that segment. If you implement anything like this, let me know and you are welcome to “guest post” about it! !